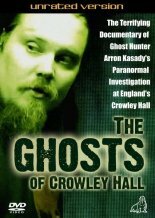 'The Ghosts of Crowley Hall’ is the documentary about the Paranormal Investigation that was carried out at the hall during the summer of 2007. It shows the events of Ghost Hunter Arron Kasady, his team of Investigators and their findings at the hall. 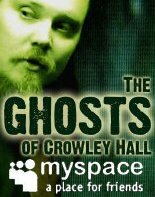 The movie is now on limited release on DVD, and can only be bought from this site or the official Crowleyhallghosts.com website at this time. 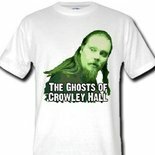 Also available are the official 'The Ghosts of Crowley Hall' T-Shirts on sale through Spreadshirt. 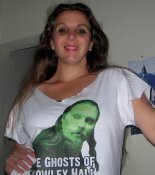 This Crowley Hall Ghosts t-shirt features ghost hunter Arron Kasady on the front, and the line 'Too Scared to Visit?' on the back along with the website. Sturdy 185 g/m², 100% cotton, this tee is our classic cut top seller. With unbeatable quality and great production. Double stitched, and a great value: high quality and competitive price. 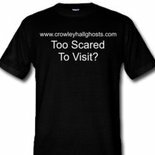 This Crowley Hall Ghosts t-shirt features line 'Too Scared to Visit?' on the front along with the website address. This 100% cotton tee has a relaxed yet tailored fit. Seamless rib collar with double-needle cover-stitching, shoulder-to-shoulder taping, double-needle sleeve & bottom hem. Product Weight: 5.6oz per square yard. 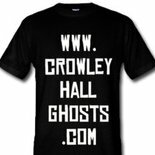 This Crowley Hall Ghosts t-shirt features the website address "www.crowleyhallghosts.com" spread accross the front.